The Regional Sponsored Migration Scheme (RSMS) is similar to the Employer Nomination Scheme, but it is specifically for employers in regional and low population growth areas in Australia.This is currently defined as all areas of Australia excluding Sydney, Wollongong, Newcastle, Melbourne, Perth, Brisbane and the Gold Coast. For full details, including postcodes, click the link. be actively and lawfully operating a business in regional Australia This is currently defined as all areas of Australia excluding Sydney, Wollongong, Newcastle, Melbourne, Perth, Brisbane and the Gold Coast..
demonstrate that it is a financially viable organisation capable of sustaining the employment of its current employees and any sponsored workers for the term of the visa. have complied with previous nomination and sponsorship obligations. ensure that you have or can obtain the relevant registrations and licensing for performing the nominated occupation while in Australia. be certified (advise only) by a Regional Certifying Body (RCB) Through their knowledge of the local labour market, RCBs certify the employer's nominated position before it is submitted to DIAC for approval..
be under 45 years of ageUnder this visa there are provisions regarding the age requirement in the case of exceptional appointments! meet any mandatory licensing, registration or professional membership requirements. 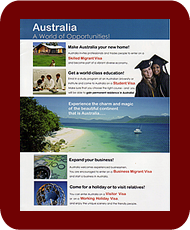 The advantage of the RSMS visa is that there is no need for you to meet one of the three additional conditions required for the ENS visa.For an ENS Visa you must have worked full-time in Australia in the occupation for which you are being nominated, while holding a specified visa (eg a 457 visa) for at least 2 years immediately prior to applying for the visa (including at least the last 12 months with the nominating employer) OR you must have qualifications assessed as equivalent to the Australian standard and have 3 years post-qualification experience in the occupation (unless the position is an exceptional appointment) OR you must be offered a position which attracts a base salary of at least the amount of salary specified in a Gazette Notice (currently A$165,000).